Our initiative, Resilient Networks NYC, is one of eleven projects supported by The New York City Economic Development Corporation’s RISE : NYC program as part of the City’s Sandy recovery effort. In five NYC neighborhoods, we are working with local partners to build community-owned mesh networks. These telecommunications networks are designed to withstand shocks and stresses and provide community-maintained, cooperatively owned critical infrastructure in flood-prone areas. But designing, seeding, and building mesh networks takes time and effort. Our community partners—Fifth Avenue Committee (Gowanus), the Kings Bay Y (Sheepshead Bay), The Point (Hunts Point), the Rockaway Development and Revitalization Corporation or RDRC (Far Rockaway), and Silicon Harlem (East Harlem)—have spent more than a year and a half pounding the pavement to get local businesses on board to participate in hosting the networks. They’ve also spent the last year training local residents to build and maintain the networks and planning for how to support and fund the project in the long term. Meanwhile, each local partner has been training Digital Stewards—local residents knowledgeable about technology and skilled at organizing—to design and maintain the networks for the long term and in emergencies. All the time that has gone into this effort is well worth it: our partners have built relationships among community groups and local businesses, local technologists, and their neighborhoods’ vulnerable residents. The more that neighbors know each other, and share their skills and knowledge, the better they’re able to plan together for emergencies. However, with the five-year anniversary of Sandy looming, and in the midst of the most devastating hurricane season on record, we are well aware that our partners’ networks aren’t built yet. So in an effort to ensure that our partners have emergency communications capacity in case the next hurricane heads up the East Coast before we’re done with construction, the Resilient Communities team has developed Portable Network Kits (PNK). These kits are not a gadget or a device that you can buy in a store. They’re a collection of easily configured, solar-powered wifi gear that allows you to create a hotspot—either standalone or the first module of a larger community network. There are some basic elements in each kit, but kits are also customizable for different needs. All of the elements can be easily found and purchased online through Amazon or other retailers. We’ve also published a zine of easy-to-follow instructions, and we are holding a series of trainings to help people learn how to assemble and use Portable Network kits. So far, we’ve held PNK trainings at the Allied Media Conference in Detroit, the WeAct coalition in NYC, RDRC in Far Rockaway, The Point in the South Bronx, MIT’s Urban Risk Lab, and the Columbia Journalism School. We are happy to bring PNK to our partners so that they feel prepared for any storms and stresses that may come our way, and we are glad to share this information with the public so others can make their own kits and help other communities in need. For more on what the kits can and can't-do, check out our PNK FAQ below. And check back on this site for real-world learnings as we use and refine PNKs for real-world situations. An easy to assemble WiFi hotspot with a solar charger and battery backup. Can you use it to get on the internet? The PNK has two modes: “online” mode and offline or “island” mode. Anywhere from one building in most basic form to up to a few city blocks with some additional routers. This depends on how you customize it—there are different versions depending on needs. A kit also gets more expensive as you add routers. The more routers you daisy-chain together, the bigger the network scale. Do you need technical knowledge to use it? Anyone with some computer skills and training should be able to use the kit. No coding (command line) involved. People who have been trained should be able to train others. There might be some tinkering with configuring the disk image, and some trial and error with naming and connecting the routers—we try to cover this in our materials and training. What’s more important: creating shared social protocols about how to use it—what kinds of data it should collect, what kinds of services and files people should put on it, whose job it is to charge the batteries and when etc. We recommend in-person meetings to decide on these principles of sharing infrastructure. 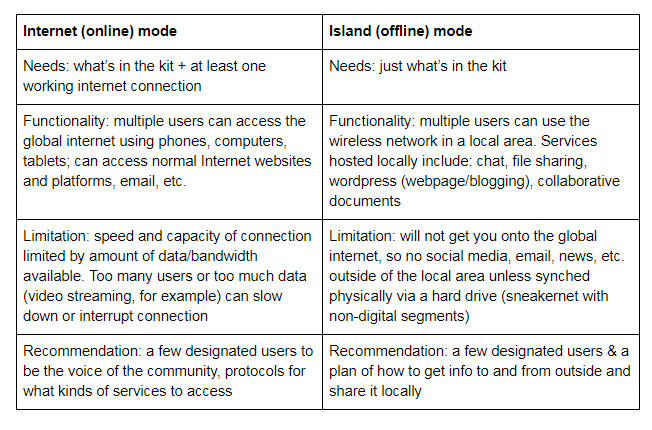 When it’s in Offline (Island) mode (not connected to the Internet), what can it do? In island mode, you have a Wi-Fi network that only connects devices in a small area - anywhere from one building or public square to about a half square mile if you add or “mesh” additional Wi-Fi devices to create a wider range. However, you CAN’T reach the global Internet, so you can’t access Facebook, Gmail, Whatsapp, or other cloud-based services. You can only communicate with people in your local geographic area who are connected to the same network. Instead, in “island mode” the services and information on the network live on a local server (the Raspberry Pi). You can see and connect to the network from your phone or computer, just like any other Wi-Fi network, to use the services and access information on the local server. Imagine a radio station that only reaches your neighborhood -- except that instead of only broadcasting out from a central transmitter, everyone can both send and receive messages, files, and information using their phones or computers. Updated Vol.2 documentation Zine coming soon! !